CHECK OUT THE 2015 CHINA PANDA BEAR GOLD COIN! . . . WE CURRENTLY HAVE ALL SIZES IN STOCK NOW! Each coin is struck in .9999 fine gold and are available in 1/10oz., 1/4oz., 1/2oz., and 1oz. sizes! 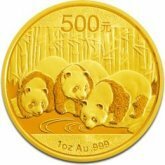 *please note that our China Panda Bear Coin jewelry will be dates of our choice coins unless otherwise requested and regardless of photo shown. A Best Seller! The 1/10 oz. 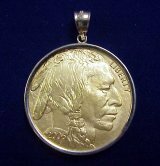 gold eagle gold coin will come to you in GEM brilliant uncirculated condition and custom mounted in our best solid 14k gold rope style bezel ready to wear and enjoy! Top Seller! 1oz. American Gold Buffalo w/14K Plain Bezel! We have the NEW BUFFALO Gold Coin Pendant... The $50 U.S. Buffalo .999 fine gold coin was first minted in 2006 and has become one of our best sellers! Every coin is in perfect gem brilliant uncirculated condition and will come to you custom mounted in our best solid 14k gold plain style tab back coin bezel and ready to wear! 1/4 oz. American Gold Eagle w/14K Plain Bezel! Your 1/4 oz. American Eagle gold coin (about the size of a U.S. Quarter) will come to you in beautiful GEM uncirculated condition and custom mounted in our best solid 14k gold plain style coin bezel ready to be worn and enjoyed! Top Seller! 1/4 oz. American Gold Eagle w/14K Rope Bezel! Your 1/4 oz. American Eagle gold coin will come to you in beautiful GEM uncirculated condition and custom mounted in our best solid 14k gold rope style bezel ready to be worn and enjoyed! Other sizes and variations are available. TOP SELLER! 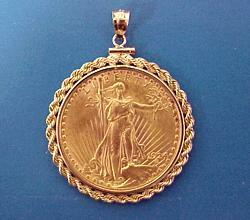 St. Gaudens $20 gold Double Eagle Coin Pendant! 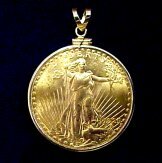 The American classic...the U.S. $20 St. Gaudens Gold Double Eagle Coin Pendant... The St. Gaudens $20 gold coin was minted from 1907 until 1933 and is a best seller at Diamondshere! Each coin is in original brilliant uncirculated condition and will come to you (date of our choice) custom mounted in our best solid 14k gold bezel and ready to wear! 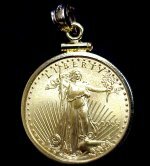 The American classic...the U.S. $20 St. Gaudens Gold Double Eagle Coin Pendant... The St. Gaudens $20 gold coin was minted from 1907 until 1933 and is a best seller at Diamondshere! 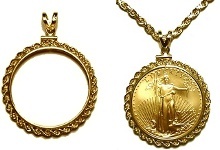 Each coin is in original brilliant uncirculated condition and will come to you (date of our choice) custom mounted in our best solid 14k gold rope bezel and ready to wear! Top Seller! 1 oz. American Gold Eagle w/ 14K Plain Bezel! BUYERS CHOICE! 1oz. 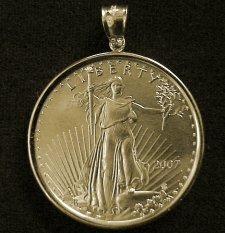 American Gold Eagle Pendant...This is the beautiful 1oz. American gold eagle coin (about the size of the U.S. Half dollar) in gem brilliant uncirculated condition...this hefty 1oz. 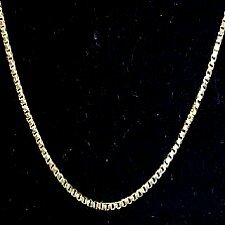 ($50) gold eagle comes mounted in our solid 14k gold plain Style bezel and ready to wear! 1 oz. American Gold Eagle w/14K Rope Bezel! Beautiful 1oz. 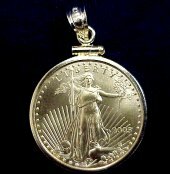 American Gold Eagle Coin Pendant...The 1oz. American gold eagle ($50 legal tender) contains 1 oz. of fine native American gold. 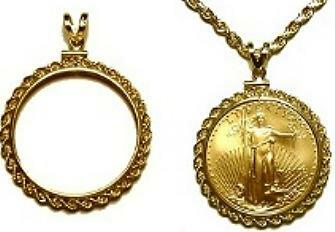 Each coin is in brilliant uncirculated condition and comes mounted in our solid 14k gold rope bezel and ready to wear!